I did a research on Google about Stellar wallets and the first option was an overview about those written on Galactic Talk, almost a year ago. Although the review is great, nowadays many other wallets appeared and are ready to use, so I decided to write an updated overview about some of the wallets after testing them. Those options are also listed on Stellar network , but it just talks briefly about each wallet, where it can be used (web, Android, Mac/Windows) and gives a link to each of them. This is a problem if the user has no other account in different wallets. 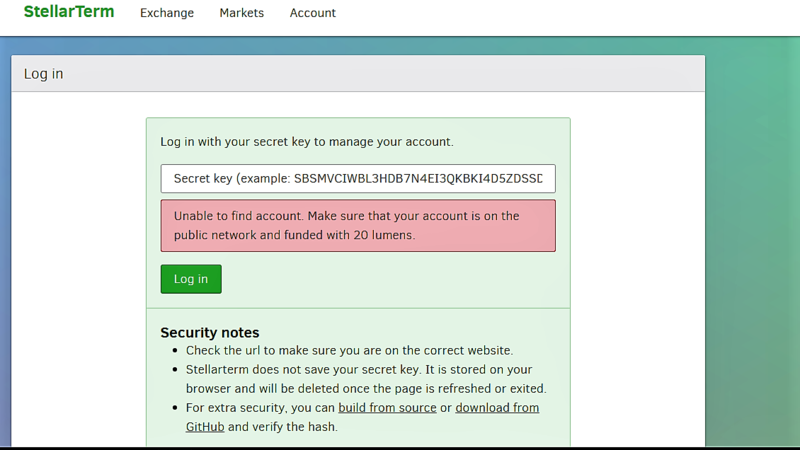 One option is to create an account with another wallet, like Centaurus for example, and use the secret key generated on this one after receiving minimum value of Lumens. 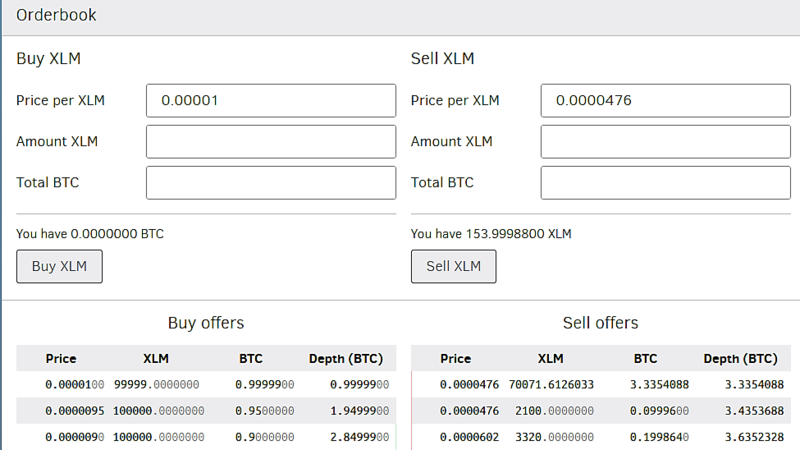 Another option is to buy Lumens at an exchange platform like Kraken or Poloniex and send to the key generated at Stellar Account Viewer. 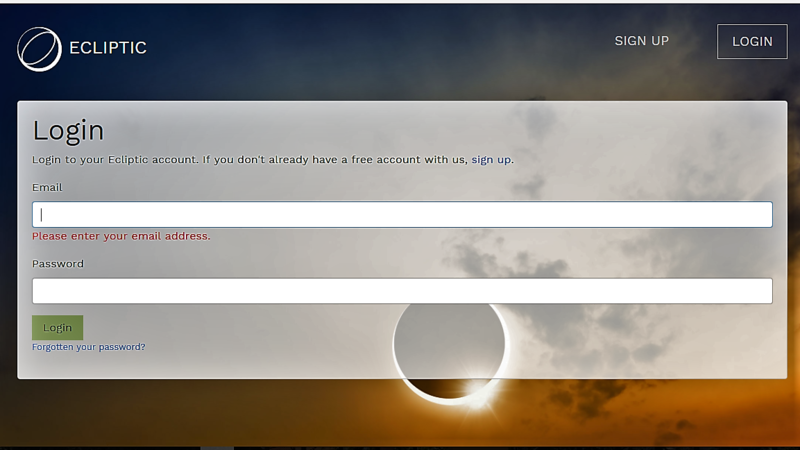 It’s also important to notice that Stellar Term doesn’t have the option to send currencies between users/accounts. It’s a platform where the user can exchange currencies, for example buy Euros and sell Lumens, after creating a trust line to trade. The account shows the user’s balance, trusts and assets that are possible to trade with those trusts. 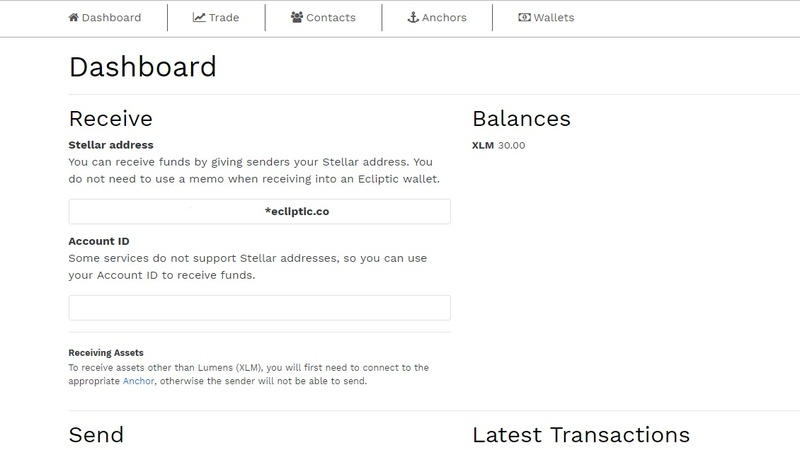 However, it doesn’t give an option to send directly XLM for example to another user, just to keep your Lumens, Euros. •	Default: this is the wallet automatically created by Ecliptic with a Stellar address and an Account ID, which can be shared with different wallets. •	Hosted: those have a secret key provided and restored by Ecliptic, so the user can still access the account even if he/she loses it. •	Client Side: different than the hosted wallet, with the client side the user has to keep the secret key in order to access the wallet, because it only remains in the browser until the user is logged in. •	Read Only: finally, this wallet doesn’t allow the user to do any transactions, just allows to track wallets to which he/she doesn’t know the secret key. 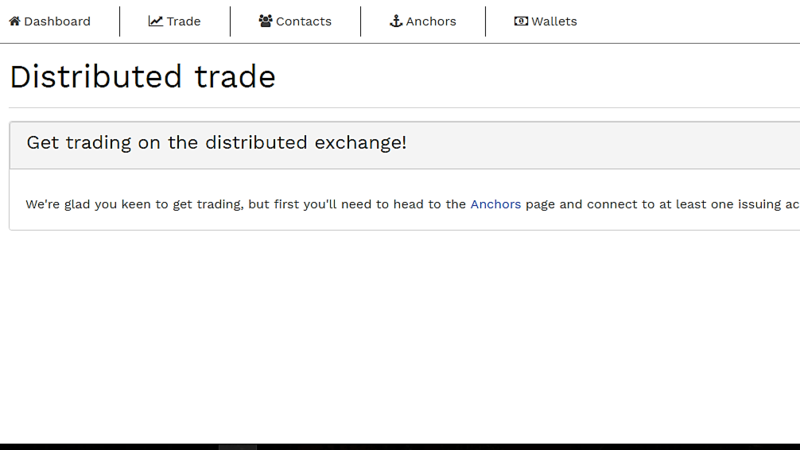 After connecting to at least one issuing account on the anchors page, the user can also trade currencies. 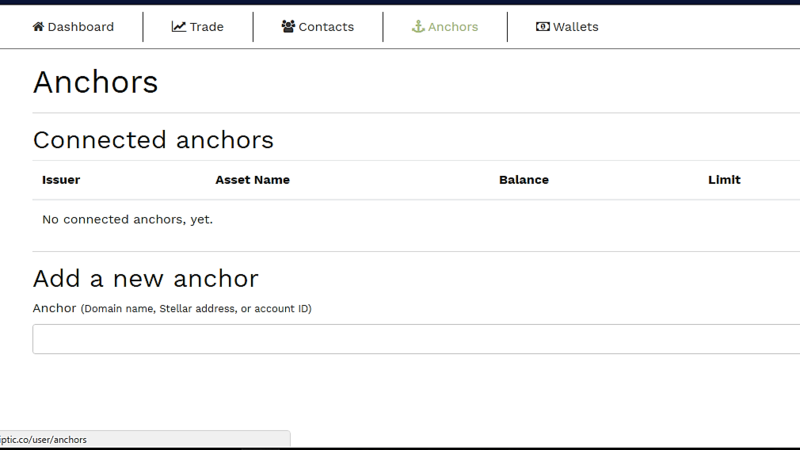 It doesn’t provide popular exchange markets as Stellar Term, so the user has to put the anchor’s account ID, federation address or Domain name. The federation name is similar to the one given in Stargazer wallet, as I explained in a previous article. This wallet also provides the secret key, you simply click on the user name at the top right corner and it gives this option. 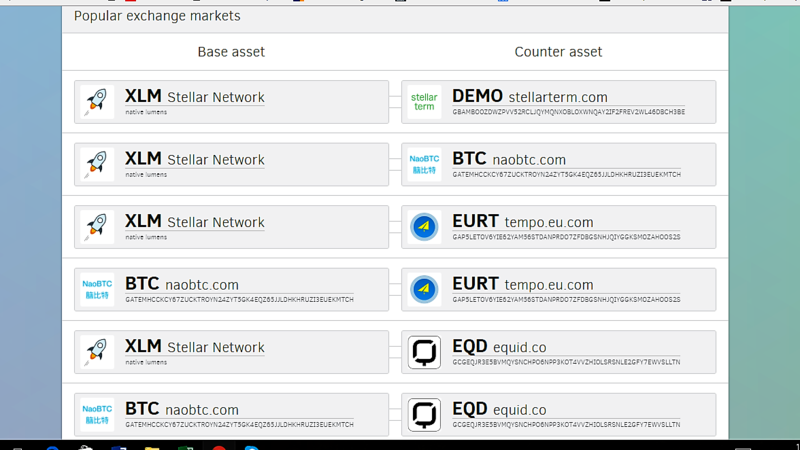 One thing I missed at Ecliptic is that it doesn’t have a list of the most popular exchange markets as Stellar Term does, so the user has to find the anchor’s ID. In that aspect, Stellar Term is more user friendly, especially for beginners who don’t know many anchors. 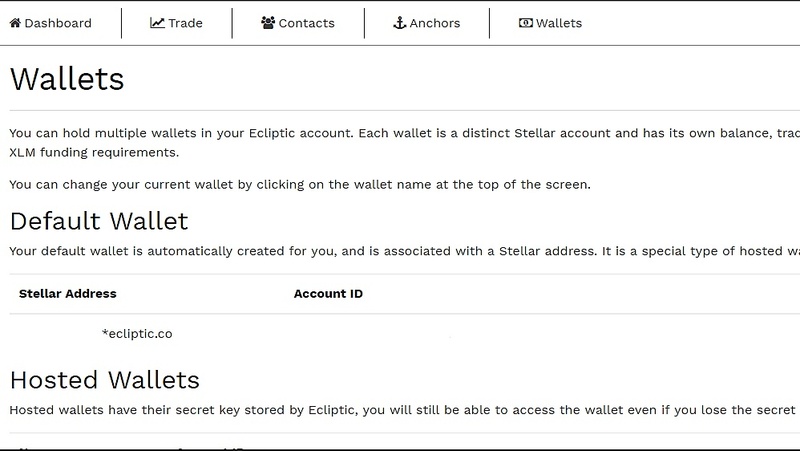 On the other hand, Ecliptic is a more complete wallet that gives many features and options to the user while Stellar Term doesn’t even allow to send currencies to other accounts. 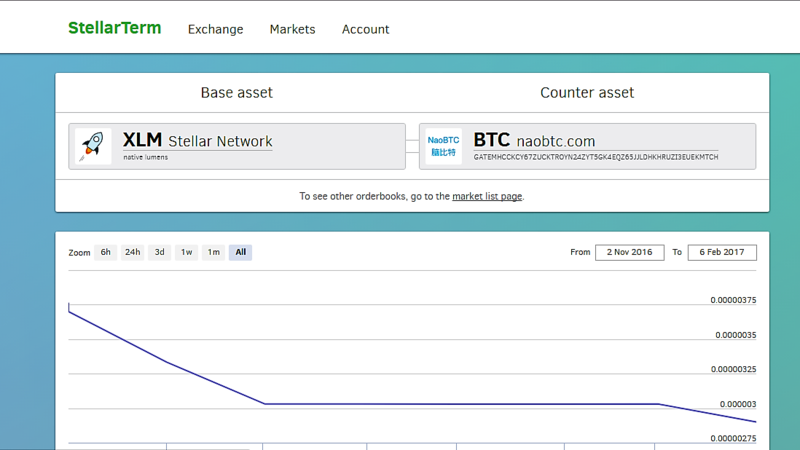 Stellar Term maybe can be considered more a trading platform than a wallet itself.